The turn of seasons brings about many changes. 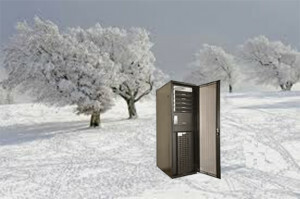 We adjust the thermostats in our homes and, similarly we must also control the environment in a data center. But, it is not just about accommodating for the varying temperature and adjusting the thermostat. In a data center, humidity must also be accommodated for to keep equipment functioning properly. While temperature and cooling is often the focus, humidity control cannot be overlooked. There is a range of acceptable humidity at which most data centers should maintain but if they stray outside the range, problems can ensue. Data centers must constantly monitor the humidity level in its room. When a data center is too humid condensation will inevitably show up. If condensation happens on the many electrical components in a data center they could possibly short out. Shorting out equipment = big problem for data centers. Conversely, when humidity is too low ESD or electrostatic discharge, can occur. And yes, it is as frightening as it sounds. ESD emits a static electricity shock and when that happens in a data center it could shock electrical equipment so much that it shuts down completely. The shock may even be so strong that it damages electrical equipment. All of these scenarios lead to downtime in a data center and as any data center manager knows, downtime costs money and leads to a lot of frustration, even if downtime only lasts a moment. For this reason it is critical that data centers implement a humidification system. Once humidification systems are implemented it is critical that they are maintained on a regular basis to ensure that they are working year round. Just like any other equipment in the data center, humidification systems can gradually wear down over time or encounter seasonal glitches, right as they are most needed. An annual, or better yet, bi-annual check of the humidification system will help ensure that it is working when it is needed most so that mission critical data center equipment can be protected. Humidity tends to decrease during the colder months and increase during the warmer months so appropriate adjustments for those seasonal changes can be made in advance. 40% humidity is around the recommended level of appropriate humidity for a data center but the acceptable range is much larger – between 20-80%. Most experts say that maintaining closer to 40% is truly ideal, though, and that by doing so equipment will be better protected and the heating and cooling system will not need to work as hard to maintain appropriate temperatures. This entry was posted in computer room maintenance, data center cooling, Data Center Design, data center equipment, Data Center Infrastructure Management and tagged computer room maintenance, data center cooling, data center design, data center equipment. Bookmark the permalink.